What a difference a decade makes. Only 10 years after China sent its first lunar spacecraft on an orbital mission, the nation accomplished something nobody has managed to do before: plunk a lander, Chang'e 4, on the far side of the moon. Read here about the Chinese missions since 2009 and what the pioneering Chang'e 4, which touched down in January 2019, is expected to accomplish. Chang'e 1 launched in October 2007 on a 16-month mission to map the moon. The spacecraft scrutinized the lunar surface, analyzed the composition and depth of the materials there, and also looked at the surrounding environment. The mission fulfilled all of its objectives and controllers deliberately crashed the spacecraft onto the moon on March 2, 2009. Chang'e 2, the second Chinese lunar mission, launched for Earth's nearest close neighbor on Oct. 1, 2010. It returned a high-resolution map of the entire moon's surface and took close-up images of the Bay of Rainbows, where mission planners at the time suggested they might put down the country's first lander. Chang'e-2 left the moon's neighborhood in April 2012 to fly by the asteroid 4179 Toutatis, which it reached in December 2012. Chang'e 3 was the third Chinese lunar mission and the first to land on the surface. It made a safe landing on the moon on Dec. 14, 2013, at Mare Imbrium, on a site later called Guang Han Gong (Moon Palace). Chang'e 3 took images of the night sky from its perch on the surface, using an optical telescope, and it sent back imagery of the surrounding area as well as of its rover, Yutu. It also discovered a new kind of basaltic rock in 2015. Chang'e 3 is most famous for the deployment of its rover, Yutu — the first one to deploy on the moon since 1976. After heading out to the surface on Dec. 14, 2013, Yutu took many images and panoramas that were sent back to Earth, showing the surrounding environment. The rover moved well for a few days in December; by January 2014, after it emerged from the sleep mode it had entered to survive the long lunar night, it appears all drives had stopped. But the rover kept transmitting data until 2015. In October 2014, China shifted tracks and launched its first round-trip moon journey, dubbed Chang'e 5 Test 1 mission. The mission was supposed to test the performance of spacecraft items such as its heat shield, guidance, navigation and control. Once analyzed, this information was expected to be included in future lunar-landing missions. The spacecraft also carried some smaller satellites from LuxSpace in Luxembourg and Pocket Spacecraft in the United Kingdom. NEXT: Chang'e 5 Test 1 Landing! The Chang'e 5 Test 1 mission landed safely in Mongolia on Oct. 31, 2014. Meanwhile, the service module remained in space to run rendezvous tests for the future Chang'e 5 mission, which is expected to bring lunar samples back to Earth. China plans to launch Chang'e 5 late in 2019 and bring back at least 4.4 lbs. (2 kilograms) of samples upon its return. Since landing on the far side of the moon requires a satellite, China sent the Queqiao relay satellite toward the moon on May 20, 2018. 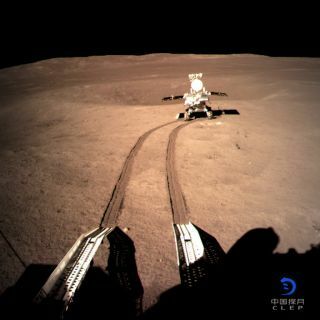 The far side of the moon permanently faces away from Earth, so Queqiao acts as a relay for the pictures and data that the Chang'e 4 mission transmits back to Earth. Queqiao is stationed at a gravitationally stable spot called Earth-moon Lagrange point-2, which is roughly 40,000 miles (64,000 kilometers) away from the moon's far side. Chang'e 4 descended into history Jan. 2, 2019, when it made a safe touchdown on the far side of the moon. The spacecraft landed in Von Kármán Crater, taking pictures of its gentle fall using a descent camera. The lander and its rover will work together to learn more about the moon's radiation environment, surface and subsurface. They also will do radio astronomy, as well as a small biosphere experiment. Early images of the far side of the moon from Change '4 showed a dusty environment that will come under great scrutiny in the weeks after landing, which the mission is exploring with the rover Yutu 2. The far side is a more rugged environment in general than the near side, since tidal erosion has been pulling on the moon's near side and smoothing out the features there for eons. However, there are zones on the far side that are safe enough for lunar landings.